Commonly used rodenticides and lawn and garden insecticides can be harmful to cats and dogs if ingested, so keep them out of reach. Keep citronella candles, tiki torch products and insect coils of out pets’ reach as well. Call your veterinarian or the ASPCA Animal Poison Control Center at (888) 426-4435 if you suspect your animal has ingested a poisonous substance. Remember that food and drink commonly found at barbeques can be poisonous to pets. Keep alcoholic beverages away from pets, as they can cause intoxication, depression and comas. Similarly, remember that the snacks enjoyed by your human friends should not be a treat for your pet; any change of diet, even for one meal, may give your dog or cat severe digestive ailments. Avoid raisins, grapes, onions, chocolate and products with the sweetener xylitol. Please visit our People Foods to Avoid Feeding Your Pets page for more information. Treat your pet to stainless steel or ceramic bowls, because plastic bowls scratch easily and can retain bacteria. Washy the bowls in hot water and dishwashing liquid every day. Keeping cool when temperatures reach record highs isn’t just about comfort. Dangerously high temperatures can result in heat-related illnesses ranging from heat cramps to heat exhaustion and heat stroke. 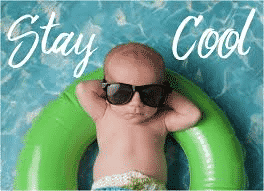 The following tips can help you keep cool all summer long. Alter your pattern of outdoor exercise to take advantage of cooler times (early morning or late evening). If you can’t change the time of your workout, scale it down by doing fewer minutes, walking instead or running, or decreasing your level of exertion. Keep plastic bottles of water in the freezer; grab one when you’re ready to go outside. As the ice melts, you’ll have a supply of cold water with you. I learned this trick from a tennis pro: if you’re wearing a cap or hat, remove it and pour a bit of ice cold water into the hat, then quickly invert it and place on your head. Instead of hot foods, try lighter summer fare including frequent small meals or snacks containing cold fruit or low fat dairy products. As an added benefit, you won’t have to cook next to a hot stove. If you don’t have air-conditioning, arrange to spend at least parts of the day in a shopping mall, public library, movie theater, or other public space that is cool. Many cities have cooling centers that are open to the public on sweltering days. Finally, use common sense. If the heat is intolerable, stay indoors when you can and avoid activities in direct sunlight or on hot asphalt surfaces. Pay special attention to the elderly, infants, and anyone with a chronic illness, as they may dehydrate easily and be more susceptible to heat-related illnesses. 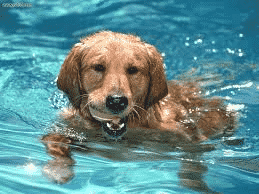 Don’t forget that pets also need protection from dehydration and heat-related illnesses too. Clean window units once a month when you are using them regularly. Turn off the power, remove the unit’s front panel, and vacuum any visible dirt from the interior coils. Remove the filter and use your vacuum upholstery brush to vacuum heavy dirt, then wash the filter at the kitchen sink using mild solution of dishwashing liquid and warm water. After the filter dries, put it back in the unit. If you have a central unit, you should also clean air filters once a month during heavy use. Keep the outside condenser unit clear of leaves, grass clippings, lint form the clothes dryer and scrubs. Parental figures in the United States receive the recognition for the role they play in their children’s lives on Parents’ Day. The day aims to promote responsible parenting and to recognize positive parental role models. It celebrates the special bonds of love between parental figures and their children. Parents’ Day is celebrated on the fourth Sunday of July each year. Citizens, organizations, and federal, state, and local governmental and legislative entities are encouraged to recognize Parents’ Day through proclamations, activities, and educational efforts to recognize, uplift and support the role of parents in bringing up their children. The Parents’ Day Council plays an active role in celebrating and promoting Parents’ Day through a range of events and activities. For example, the council honors “Parents of the Year” at local, state and national levels. Those who have been nominated or selected are people who exemplify the standard and ideal of positive parenthood. Exemplary parents from each state are nominated for “National Parents of the Year”. Parents’ Day is a popular time for people to send cards and gifts, including flowers, cakes and food hampers, to those who play an important role as a positive parental figure in their lives. It is also a time for families to come together for lunches or dinners. Special tributes to parental figures who are seen as role models are made through local announcements, at church services, or at local community events. Parents’ Day proclamations and rallies have been held in recent times and involved organizations such as the United Civil Rights Councils of America. 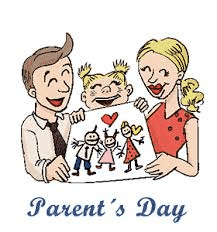 Parents’ Day is a national observance but it is not a public holiday in the United States. Parents’ Day promotes the message that the role of the parent is important in human development, which requires investment, focus, and commitment. In 1994 President Bill Clinton signed into law a resolution adopted by the US Congress to establish the fourth Sunday of every July as Parents’ Day. This day is similar to Mother’s Day and Father’s Day. According to the Congressional Resolution, Parents’ Day is established for “recognizing, uplifting, and supporting the role of parents in the rearing of children” (cited in the National Parents’ Day Council website). Images of people engaged in active learning activities with their children are often used in photos, posters, paintings, stickers and sketches to promote Parents’ Day. Images of flowers are also used to promote the day. The messages that organizations try to portray through these images are that: commitment is a core family value; parental responsibilities are important to children’s growth and development; and that unconditional love is needed for a strong bond between parental figures and their children. Parental figures include biological, foster or step-parents. Use chamois cloth to clean jewelry because it’s very soft and won’t scratch. If chamois cloth is not available, use facial tissue. Or purchase a special jewelry cleaning cloth. ‘Fairy Garden, fairy garden…fairy garden…’, it’s all you can hear now….the enchanted realm is calling, the fairies are itching for you to get started and your children keep asking for one. Now is the time! At Garden Sparkle HQ, I regularly receive messages from fans with requests for information on how to get started. Such a very good question indeed! In this tutorial I will show you how to make a fairy garden in a pot. Of course you are welcome to free-style it however if you’d like a step by step guide, here you go. The most important thing to remember when embarking on this journey is that with fairy gardening there are no rules (yes NO RULES…you can sigh with relief now!). Of course there are more traditional approaches to miniature fairy gardening, however through my eyes and experience it is a joyful, creative, exploratory and almost meditative process that is sure to fire up the imagination of all involved. It is a chance to be swept up in the magic of childhood, enchanted miniature worlds and fanciful fairy tales – no matter your age! First up there are a few things you need to consider? What sized pot/container will you use? 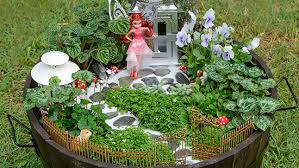 Fairy gardens can be created in pretty much any sort of container (traditional gardening pot, wheel barrow, old roasting dishes, old sink, plastic sandpit container, bath tub etc.). Just make sure that there are drainage holes. Remember the larger the surface area the more room you will have to create your fairy garden landscape. The pot I used in this project has a diameter of 55cm. Where do you plan to position your fairy garden? Indoors or outdoors? For an outdoor fairy garden a sheltered area is recommended e.g. on your veranda, patio or under some sort of roof which will help to protect your accessories from the harsh elements. The best location will also depend on the plants you choose and their growing requirements (sun/shade & water). For indoors you will need to make sure you position your pot where there is adequate sunlight. I intend to place my garden in a sheltered area on our patio which receives morning sun and shade for the rest of the day. Rest assured that I have handpicked the very best for you in the Garden Sparkle range so your task of choosing accessories will be so much easier! TIP: If you still feel swamped for choice, sometimes it can help if you choose a theme (like you would for a birthday party!) e.g. enchanted woodland, rainbow, country garden, tea party or a certain color etc. This can help to fire up your imagination and narrow down what you want. It can also help to dream up what you think the fairies will need in their new home and the activities they’d enjoy. An eating area with a table setting, mini playground, mail box for letter writing, wheel barrow and watering can for gardening or a water feature etc. Center piece + key features: Choose a center piece (focal point) for your fairy garden e.g. a fairy house or fairy door plus a few key features. I was keen to create a whimsical woodland fairyland so chose the Woodland Cottage as my center piece, a medium pond as a water feature, and a woodland arbor and cobblestone pathway for the magical entrance. Accessories & accents: Select extra accessories and accents depending on your budget and what you’d like to provide for your fairies. I chose a leafy table set, acorn tea set, opening mail box, acorn lamp, fairy garden ladder, a sunflower see-saw, and a set of fairy garden toadstools. A tree for your fairy garden (miniature of course) to give height. I chose one of my favorites, a Cuphea hyssop folia ‘Compacta’. A couple of small shrubs (mid height) which can be used to create an element of repetition in your landscape and help tie it all together. I decided to choose a mix of different colored Hypo Estes. A decorative foliage plant with green leaves splashed with pink, rose and white. Great for a splash of color and contrast. Ground cover which can add patches of greenery either in the form of a low growing vines, succulents, live moss or grass. I absolutely love using Ficus Pumila which is a miniature creeping fig with crinkly, heart-shaped leaves. Vines can easily be woven into arbors (as pictured below), arches and other structures. Fairy folk also love flowers so you might like to choose a miniature tree or smaller shrubs which will flower (in this case I opted for a flowering Compact Cuphea with pretty pinky purple flowers). TIP: Remember you don’t want to over crowd your pot so be selective and remember to give your plants room to grow. You’ll want to make sure you are kitted out with some basic supplies for fairy gardening. You might already have these at home or may need to purchase them from your local nursery/gardening center. Natural found objects can also help to create that special themed setting. Have fun collecting interesting rocks, pebbles, shells, seed pods, pine cones, driftwood etc. Once you have chosen your accessories it can be fun to brain storm and map out your ideas of where they will be positioned in your fairy garden. The whole family can get involved! You don’t have to follow your plan exactly but it can be a great way to spark up your imagination and help to generate ideas. You might even end up creating something completely different but whatever happens just let it flow…. It’s GO time! Fill your pot/container with potting mix and plant your plants. I prefer to plant the tallest plant (miniature tree) towards the back of the pot, shrubs to the side and ground cover at the front. TIP: You might like to play around with the arrangement of your plants while they are still in their pots. If necessary add your fairy house or door at this time to work out the right placement for your plants. Step 4. Add the main features, pebbles and extra natural materials. Add your center piece fairy house or door and the key features. Then use pebbles to fill in areas. I like to use a mix of colored and natural pebbles to create contrast. Whole areas can be blocked in with pebbles, it depends how much soil you want showing. Pathways can also be marked out with pebbles. Extra natural materials can be added to create interesting areas in the landscape e.g. a dry river bed, a mini cliff top or cave etc. Water your plants to help them settle in. Add special touches by collecting flowers to decorate window boxes, water features and other areas. My fairies regularly leave little gifts in the miniature mail box for me…fresh flowers, little letters and treasures. Bless your fairy garden with a sprinkling of magic dust and sparkles. Remember fairy gardening is an ‘evolving’ process. It can be a real joy to watch your fairy garden change and develop over time especially with the creative input of the whole family. Enjoy the journey of fairy gardening! When the initial battles in the Revolutionary War broke out in April 1775, few colonists desired complete independence from Great Britain, and those who did were considered radical. By the middle of the following year, however, many more colonists had come to favor independence, thanks to growing hostility against Britain and the spread of revolutionary sentiments such as those expressed in the bestselling pamphlet “Common Sense,” published by Thomas Paine in early 1776. On June 7, when the Continental Congress met at the Pennsylvania State House (later Independence Hall) in Philadelphia, the Virginia delegate Richard Henry Lee introduced a motion calling for the colonies’ independence. Amid heated debate, Congress postponed the vote on Lee’s resolution, but appointed a five-man committee—including Thomas Jefferson of Virginia, John Adams of Massachusetts, Roger Sherman of Connecticut, Benjamin Franklin of Pennsylvania and Robert R. Livingston of New York—to draft a formal statement justifying the break with Great Britain. On July 4th, the Continental Congress formally adopted the Declaration of Independence, which had been written largely by Jefferson. Though the vote for actual independence took place on July 2nd, from then on the 4th became the day that was celebrated as the birth of American independence. In the pre-Revolutionary years, colonists had held annual celebrations of the king’s birthday, which traditionally included the ringing of bells, bonfires, processions and speechmaking. By contrast, during the summer of 1776 some colonists celebrated the birth of independence by holding mock funerals for King George III, as a way of symbolizing the end of the monarchy’s hold on America and the triumph of liberty. Festivities including concerts, bonfires, parades and the firing of cannons and muskets usually accompanied the first public readings of the Declaration of Independence, beginning immediately after its adoption. Philadelphia held the first annual commemoration of independence on July 4, 1777, while Congress was still occupied with the ongoing war. George Washington issued double rations of rum to all his soldiers to mark the anniversary of independence in 1778, and in 1781, several months before the key American victory at Yorktown, Massachusetts became the first state to make July 4th an official state holiday. After the Revolutionary War, Americans continued to commemorate Independence Day every year, in celebrations that allowed the new nation’s emerging political leaders to address citizens and create a feeling of unity. By the last decade of the 18th century, the two major political parties—Federalists and Democratic-Republicans—that had arisen began holding separate Fourth of July celebrations in many large cities. The tradition of patriotic celebration became even more widespread after the War of 1812, in which the United States again faced Great Britain. In 1870, the U.S. Congress made July 4th a federal holiday; in 1941, the provision was expanded to grant a paid holiday to all federal employees. Falling in mid-summer, the Fourth of July has since the late 19th century become a major focus of leisure activities and a common occasion for family get-togethers, often involving fireworks and outdoor barbecues. The most common symbol of the holiday is the American flag, and a common musical accompaniment is “The Star-Spangled Banner,” the national anthem of the United States. Never mix bleach with ammonia or any other cleaner. When using wear rubber gloves or other non-porous boots, glove and eye protection. Try not to breathe in product fumes. If using products indoors, open windows and doors to allow fresh air to enter.